I am delighted that Road Accidents: Prevent or punish? is being reprinted. I am very familiar with the work of John Leeming, who I much admired, and we are delighted to have his original papers in the library at Beaulieu. Leeming’s book should be made compulsory reading for every politician, every police traffic officer, and every civil servant working in the transport sector. Perhaps then we would begin to make real progress towards Leeming’s vision of roads that are safe and enjoyable for everyone and see the end of the fruitless war waged by the State against motorists. “It is of no practical use to say that such-and-such must or could or should or might cause accidents. We must know if it does cause them.” John Leeming argues that the whole effect of our present motoring laws and the propaganda to which we are all subjected is to concentrate attention on punishing the motorist rather than on discovering what causes accidents. Indeed our present police procedure actually makes it impossible for the local traffic engineer to discover the cause. Until we stop hounding the motorist and concentrate on discovering the cause of accidents, the appalling slaughter on the roads will continue. The responsibility of the police is confined to proving that the motorist has broken a law. No one questions why he broke the law—there may be any one of a dozen reasons connected with road layout or surfacing or inefficient and sometimes invisible signs. But these are not investigated and continue to trap motorists, causing a stream of accidents from the same cause at the same place. A long succession of Transport Ministers have been faced with an ever-increasing accident rate. They have all blamed the motorist and the motor manufacturer. They have imposed continually restrictive speed limits and ever more swingeing penalties. But they have never accepted that the first essential of preventing accidents is the investigation of causes and the financing of the road improvements which must inevitably follow. 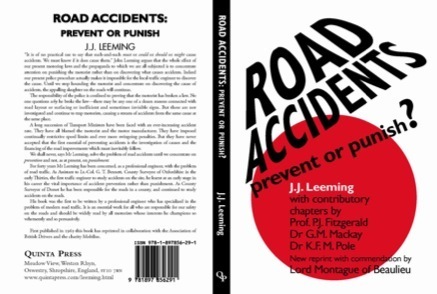 We shall never, says Mr Leeming, solve the problem of road accidents until we concentrate on prevention and not, as at present, on punishment. For forty years Mr Leeming has been concerned, as a professional engineer, with the problem of road traffic. As Assistant to Lt.-Col. G. T. Bennett, County Surveyor of Oxfordshire in the early Thirties, the first traffic engineer to study accidents on the site, he learnt at an early stage in his career the vital importance of accident prevention rather than punishment. As County Surveyor of Dorset he has been responsible for the roads in a county, and continued to study accidents on the roads. His book was the first to be written by a professional engineer who has specialized in the problem of modern road traffic. It is an essential work for all who are responsible for our safety on the roads and should be widely read by all motorists whose interests he champions so vehemently and so persuasively. First published in 1969 this book has reprinted in collaboration with the Association of British Drivers and the charity Mobilise. JOHN JOSEPH LEEMING, B.Sc., A.C.G.I., F.I.C.E., M.I. Struct. E., M.I. Mun. E., F. Inst. H.E., retired as County Surveyor of Dorset in 1964 after eighteen years of responsibility for the roads in that county. From 1924–46 he served the Oxfordshire County Council, as Resident Engineer on road works, Chief Engineering Assistant and finally Deputy County Surveyor. He is the author of Road Curvature and Superelevation and Statistical Methods for Engineers and has written numerous papers on bridge design, road curvature, and accidents. For these papers he has been awarded a Telford Premium by the Institution of Civil Engineers, the Institution Medal of the Institution of Structural Engineers and the Medal of the Institution of Municipal Engineers. DR G. M. MACKAY, B.Sc., S.M., Ph.D., A.M. Inst. H.E., who writes on vehicles and accidents, established in 1963 at Birmingham University the Road Accident Research Unit within the Department of Transportation and Environmental Planning. He is in charge of a ten-man team consisting of traffic and mechanical engineers, doctors and a psychologist who conduct research into both accident causation and injury causation aspects of road accidents. The main research has concentrated on detailed on-the-spot investigation of collisions within a few minutes of their occurrence. In 1966 he was awarded a Ph.D. for research into urban road accidents and is now a senior research fellow of Birmingham University. His particular interests are vehicle design for crash protection for both occupants and pedestrians. DR K. F. M. POLE, L.R.C.P. & S. (Edin)., L.R.F.P. & S. (Glas. ), M.D. (Vienna), who writes on the driver from the medical aspect, has been a police surgeon to the Kent County Constabulary, which brought him into close contact with the medical aspects of traffic problems. He has lectured to the Institute of Traffic Administration and to ROSPA. PROFESSOR P. J. FITZGERALD, M.A., who writes on the law and the motorist, was called to the Bar at Lincoln’s Inn in 1951. He was elected Law Fellow of Trinity College, Oxford, in 1956, was appointed Professor of Law at Leeds in 1960, and in the University of Kent in 1966. He was an editor of Salmond on Jurisprudence and has written an introductory work on Criminal Law. First published in 1969, this book is now available once again at £9.99+£1.50p&p (in the UK; £2.00p&p in Europe and £5.25p&p in the Rest of the World).